The Moon is the Solar System body closest to Earth. 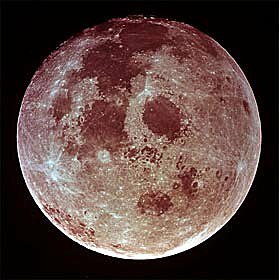 Since the earliest times, humans have used visible changes in the Moon – its phases – to measure time and create calendars. In fact, we designate the length of our month as the time between one full Moon and the next. The Moon is embedded in many of the world's mythologies. The ancient Egyptians thought of the Moon as the god Isis. The ancient Greeks saw it as the goddess Selene. The ancient Romans considered the Moon to be the goddess Luna. Maria. The Moon has two kinds of landscape — maria and terrae. Dark areas we see on the surface are referred to as maria because ancient peoples thought they were seas on the Moon. They imagined that liquid water was flowing in those regions. The singular form of the word for these lunar seas was mare and the plural was maria. The largest mare was thought of as an ocean or oceanus. The plural form was oceani. Much more recently, we have come to learn that maria are solidified lava that flowed and hardened some four billion years ago when the Moon was volcanically active. The largest of the maria is Oceanus Procellarum. The first human landing on the Moon was at Mare Tranquillitatis in 1969. Terrae. The lighter-colored regions on the Moon's surface called terrae were seen by the ancients as land masses around the seas. It turns out that they are highlands and are the most ancient regions of the Moon. Terrae are pockmarked with countless craters. Craters. Craters are scars on the lunar surface following millions of years of impacts by incoming chunks of matter from asteroids and comets. One really big crater named Tycho can be seen by eye in the southern region of the Moon. Tycho is 53 miles across and surrounded by huge walls 2.8 miles high. Bright rays of lighter soil in the landscape, which seem to shoot out from Tycho and travel half way across the lunar globe, are splash marks where molten rock splattered across the face of the Moon as a massive asteroid crashed down to form the crater. Atmosphere. The Moon has virtually no atmosphere. That means humans would have no atmospheric protection from harmful solar radiation and they would have no natural air to breathe. However, hydrogen and other elements stored in the Moon's surface may provide fuel sources so air could be generated and radiation protection built. Creation. Scientists don't agree on how the Moon was formed. It may have been created after a collision between Earth and some very large body four billion years ago. The far side. From Earth, we only can see half of the Moon, because it spins on its axis as it orbits Earth. The first views of the back side were photos in 1959 by the USSR's probe Luna 3. Later, the USSR spacecraft Zond 7 retuned the first clearf pictures of the back side in 1965. This is no coincidence. Because the Moon is not completely round and bulges slightly, unbalancing its gravitational force. This forced the Moon's rotation to slow down, until its bulge was aligned with the Earth. The force exerted by the Moon on the Earth is having a similar effect on the Earth's rotation. Gradually the Earth is slowing down. One day, the length of time the Earth takes to spin round its axis will be the same as the Moon takes to orbit us. When that happens, we will only be able to see the Moon from one side of the Earth. This has already happened on Pluto, where you can only see its moon, Charon, from one side of the planet. Phases. Phases of the Moon Over the course of a month, the Moon appears to grow ('wax') and shrink ('wane'). The phases occur because half of the Moon is illuminated by the Sun. But this is not always the same half that is visible from the Earth. The phases of the Moon have often been associated with madness, giving rise to the English word 'lunatic'.